It's 10 a.m., and you haven’t showered or gotten dressed. Your teeth are unbrushed, and your coffee is cold. You have just reminded your toddler for the fifty-seventh time not to put his hands down the back of his pants. You expertly juggle your newborn in one arm while dishing out a moderately healthy snack for your toddler with the other. You are a mother, and you feel bone-weary. 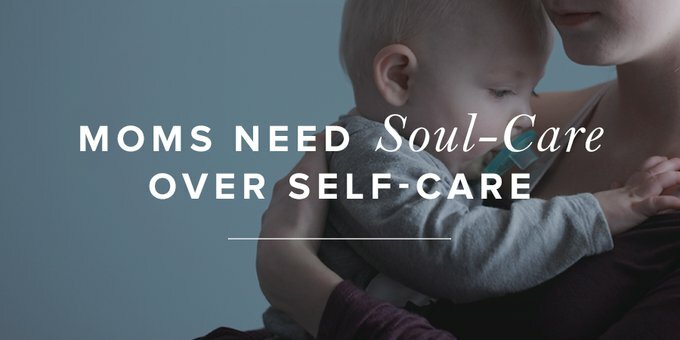 Our culture has offered up a solution for the frazzled and frantic mom who never manages a moment alone: self-care. It's almost impossible to visit a motherhood website, blog, or play group without running into it. The concept of self-care is simple: If the plane is going down, you should put your oxygen mask on first before assisting others. But if your motherhood plane is about to crash and burn, God is the only source for the oxygen you need to survive the fall. Soul-care and self-care may look the same from the outside. They both may involve getting physical rest, reading good literature, eating well, creating art, and exercising. But self-care comes from the attitude of self, of building your kingdom, of idolizing your own needs. Soul-care seeks to know God better through both His Word and His world and humbly accept your human limitations.